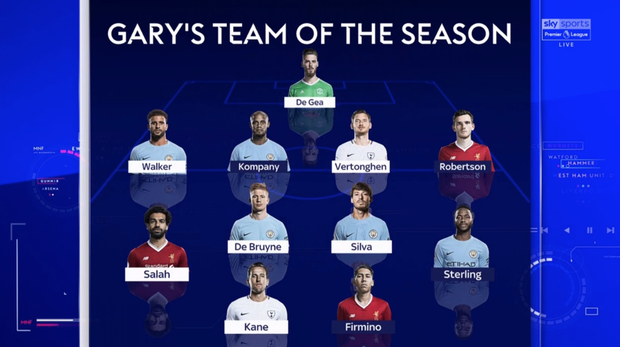 Gary Neville has named his Premier League team of the season and one of his defensive selections has is certain to spark plenty of debate. Manchester City skipper Vincent Kompany has started just 16 league games in an injury-plagued season, but Neville still felt he was one of the two best centre-backs in England's top division. Named alongside Tottenham's Jan Vertonghen in his back four, eight-time Premier League winner Neville explained why he picked Kompany in his elite line-up for the 2017/18 campaign. "I think City would have always won the league had Kompany not have played, but what I would say is he was a strength in this last two or three months when the players in the squad, who'd not won the league before, needed it," Neville told Sky Sports. "It was essential he came in. He made them look better, he made them look stronger, he led and he gave captain's performances. "For me, the last two or three months have stuck in my mind. If you'd asked me at Christmas, I may have given it to Nicolas Otamendi, but now it's just an instinct and something I'm feeling inside, and that's what I'd do if I was a player in the dressing room voting for the team of the year. I'd go for Kompany because on and off the pitch he's vital." United legend Neville picked just one player from his former club as keeper David De Gea was named between the sticks, as he explained why Liverpool's Roberto Firmino was named ahead of Manchester City's Sergio Aguero. "I love Sergio Aguero, and he's been in my team every single year. He's been my favourite striker in the past four or five years but I just felt that Roberto Firmino should be in," he added as he explained his striker picks. "When I watch Liverpool, he's been the catalyst in term of the pressing, the back-tackling, from the runs he makes in behind, he's very unselfish. "I think if you're Pep Guardiola you'd want him as your striker in terms of the way Jesus plays and the runs forward but also the runs back. Jose Mourinho would want him at Manchester United, I think Real Madrid would want him, Barcelona would want him. "He doesn't get the credit that Mohamed Salah has had this season, but for me, Firmino should be in."